WASHINGTON — Chocolate milk is coming back on the school lunch menu. So are white bread and saltier food. Several paragraphs tucked into a massive 1,665-page government spending bill released Monday would relax Obama-era nutrition standards for school lunches. On page 101 of the bill, due for congressional votes later this week, the secretary of agriculture is directed to allow states to grant schools exemptions so they can serve flavored low-fat milk and bread products that are not rich in whole grains. The bill, which keeps the federal government funded through Sept. 30, also would push back deadlines for schools to meet lower sodium levels. It would bar federal funds from paying the salaries of any government officials to implement the nutrition standards. The language would apply only to the 2017-18 school year. 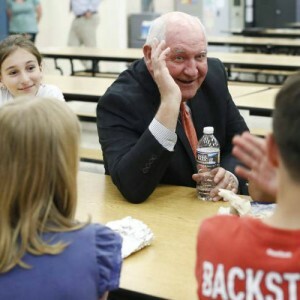 But it mirrors changes to school lunch standards the Trump administration announced Monday as U.S. Secretary of Agriculture Sonny Perdue signaled his intent to kick off a more extensive re-evaluation of the rules put in place under former President Barack Obama. He said the change was based on “years of feedback from students, schools and food service experts about the challenges they are facing” from the rules. He signed a proclamation that his department would move to ease standards for whole grains, sodium and milk during a visit to Catoctin Elementary School in Leesburg, Va. He said school food rules had cost districts and states an extra $1.22 billion in fiscal year 2015.